The Dominator module is compatible with both the current Dominator model and the new DominatorHD. 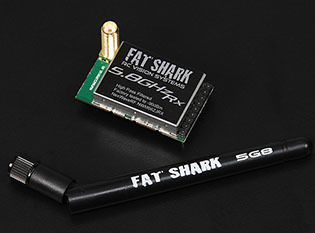 The modules allow the headset functions to be tailored to specific FPV requirements or allow upgrading as needs are indentified. The 5G8 NexwaveRF receiver module has sensitivity to less than -90dBm (approximately 40% range improvement over previous generation). The use and operation of this type of product in the USA and many other countries may require a license and some countries may forbid its use entirely. In the USA, you will need a "HAM" amateur radio license. Learn more about HAM licenses. It is your responsibility to ensure that the use of this product meets the requirements imposed by your government’s rules and regulations for RF devices. Do not purchase this product if you are unsure of the government requirements or are not able to comply with them. RC-Drones.com cannot be held responsible for your actions if you purchase and/or use this product in violation of your government's regulations. By agreeing to our terms and conditions during the check-out process, you also agree to have read and to understand this notice.